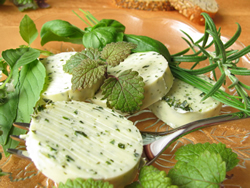 Fresh butter infused with herbs and truffles. Here, the butter is soft. Butter is the perfect vehicle for spreading flavor around, which is why compound butters are popular. Starting with butter that’s at room temperature, it’s easy to mix in flavorful herbs, spices, cheeses, wine reductions, and stocks. Simply put the butter in a bowl with the flavorings, and mix together with a wooden spoon. The result, called “worked butter,” can be used to spread on bread, as a topping on a dish, or to place over meats and vegetables. Best of all, once you make a compound butter, you can store it in your freezer for up to three months. When you need it, it’s easy to slice off a disc or scoop up a dollop as a garnish or accompaniment. Or, the butter can be rolled, chilled to solidify, and then sliced into discs. Here, the butter is mixed with various green herbs. 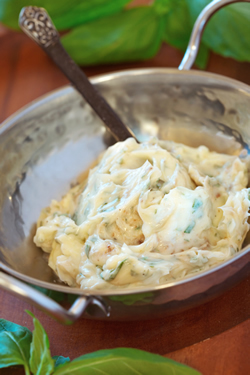 The “whipping” method is another way to make compound butter. The principle is the same as worked butter, except that you use a mixer rather than a wooden spoon. Start with the paddle blade, and then switch to the whisk, beating the butter mixture until fluffy. Unlike worked butter, whipped butter should be used right away, so that it retains its consistency. In addition to worked and whipped forms, compound butters can also be made into emulsions and foams. Help grow this exhibit! Join in the fun by sending your favorite tips for making compound butter, or your tried-and-true recipes. Read more about sharing your tips and recipes.